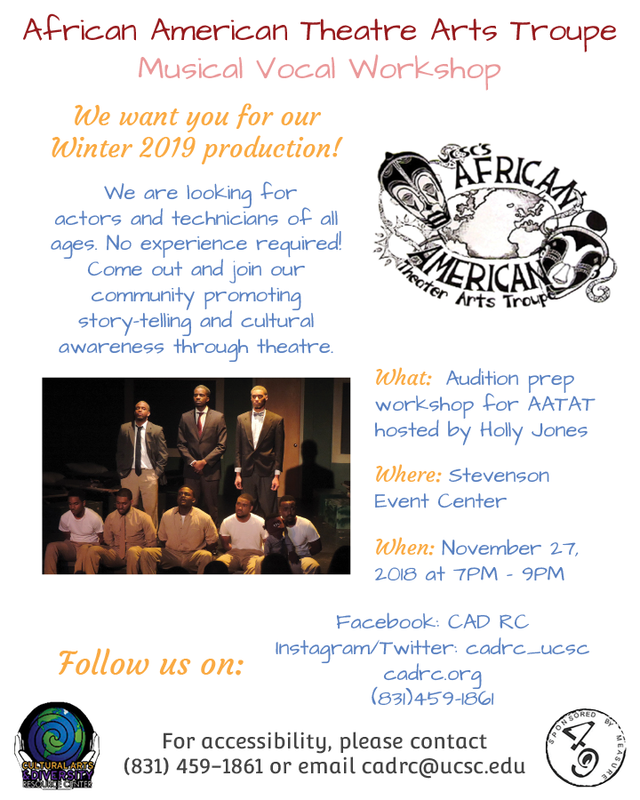 The African American Theater Arts Troupe is looking for you! The African American Theater Arts Troupe will be holding its General Auditions! We encourage any and all individuals interested to come out, audition and gain more insight into the show, the process and the troupe as a whole. We are looking for actors and technicians of all ages. No experience required. Please come out and join our community, promoting story-telling and cultural awareness through theater. Audition participants are required to present a one minute monologue, 30 seconds of song and 30 seconds of movement on stage in front of the instructor & fellow auditioning participants. Please have your audition piece timed prior to your audition as the one minute and two 30 second time frames are strictly enforced. Audition participants may be required to partake in the cold reading of specific scenes and/or roles and/or an improv game or exercise. Are you a stage manager? Contact the Theater Arts Department for more information!